I’m still in the 1980s mood, so today and for the next few blog entries, I am going to work with the Texas Instruments TI-55 III from the mid 1980s. Anyone want to play Pac Man or Super Mario Brothers? 1986-1987, the one I have is from 1987 made in Italy. This model was also made in Taiwan. I purchased from Amazon for $23 including shipping. All the keys work and the display is in good working order. The paint on the equals, plus, minus, and multiplication keys are either completely or partially worn off. However, everything works! From what I was able to research, about $40 to $50 (that is an educated guess). The TI-55 III is based off of the original TI-55 (1977) and TI-55 II (1981). The original TI-55 had only 32 programming steps but included 10 memory registers. When the TI-55 II came out, the programming memory was increased to 56 steps, but the number of memory registers were slashed to 8. Furthermore, the total memory competed with programming steps and memory registers. All bets were off if the statistics mode was engaged. The TI-55 II also added integration. 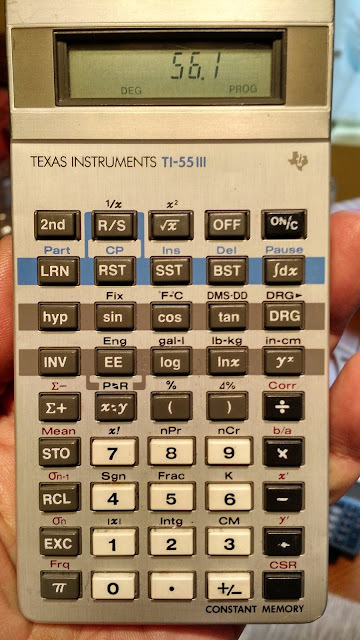 Unfortunately, the TI-55 II was plagued with bad keyboards, which led Texas Instruments to replace it with the TI-55 III (United States) or the TI-56 (foreign countries, mainly Europe). The TI-55 III retained all of the features of the TI-55 II and received better keyboards. Manual: Same as the TI-55 II. See the link above. I think the percent works backwards than modern calculators. Press the new value first, then [2nd] [ ) ] ( Δ% ), then old value, [ = ]. Maybe unique to this series is that combinations and permutations are operated on a different format. These functions take one argument in the form of nnn.rrr. Fix: This is what it says, fixed the number of the display to n places. To cancel, press [INV] [2nd] [sin] (Fix). Engineering: Engineering mode is executed with [2nd] [EE] (Eng) or sometimes when you enter large/small numbers requiring an exponent of 10. To cancel, press [INV] [2nd] [EE] (Eng). This is similar to the TI-65 and the original TI-55. The model is y = ax + b. To obtain a and b after entering the data, press [2nd] [ * ] (b/a) for the intercept (b), then [x<>y] for the slope (a). The programming model for the TI-55 III (and its predecessors TI-55 and TI-55 II) are extremely simple. There are no loops other than the RST (which sends the counter back to step 00 and stops execution). Everything is a straight-forward calculation, like a macro. Also, the more memory registers you need, the less space you have. You control the partition by the sequence [2nd] [LRN] (Part) n (where n is the number of registers desired). Using all 8 registers (R0 through R7) eliminates the programming capability. Each key is counted as step. Yes, that includes the digits. The only thing that is merged is anything combined with a [2nd] key press. The codes are straight forward, they are two digit codes where the first digit is the row number (1-9) and the second is the column number (1-5, for 2nd functions 6-0). Statistics commands are not available in programming. Integration will require at least 3 registers. Functions are ended by [ = ] [ R/S ] [RST]. The lower limit is stored in R1, upper stored in R2, press [ ∫dx ], number of intervals (up to 99), [R/S]. Source: Texas Instruments. “TI-55 II Scientific Calculator Quick Reference Guide” 4th Ed. 1984. The TI-55 III is a nice basic calculator. If you were looking for an extensive programming module, then you may be disappointed with this model since no loops are offered and the space offered is scare. Still, having the absolute value, sign, integer part, and fractional part are pluses. Despite the limitations, I am going to posts several programs for the TI-55 III in the nearby future. If you have time, could you compute 69! on that calculator and measure the time it took? I know with a watch it won't be precise at the milliseconds, but I am curious to know if it's something like 6 seconds, or 1 second for example. Timed it twice, and I got 5 seconds for 69!. Love when you do the retro stuff! I think all of the slant display models had key board issues. I like the original Ti-55 with the red LEDS. Keep up the great work! Thanks! I would not guess how the combinations/permutations are working on my TI-56 which is actually the same. Also I enjoy all the stuff from your blog related to vintage calculators. Great blog!